Our Fabric Trade Show Backdrops eliminate shipping charges, because they ship in your carry-on suitcase. All of our unique Grommet-Free Backdrops set up in minutes, attach to the pipe & drape hardware supplied by the Trade Show, and take up zero booth space. Setting up our Trade Show Backdrops is a Breeze! Five Minute Set-Up Packed In 2! A Giant Printing customer recently commented about our Trade Show Displays. “We were set up in 5 minutes and packed in 2,” she said. So while your competitors spend hours before and after the trade show you can be in and out with a smile using a Giant Printing promotional display. From Backdrops to Table Covers to Fabric Banner Stands (aka Banner Displays, Pop-ups, Roll-ups or Retractable Banners) we’ll help you get your message out at your next convention, expo or trade show. It’s a Trade Show in a BAG! Our Backdrops pack in carry-on luggage. Spend less time on set up and more time focusing on selling and attracting prospects. We offer Trade Show Displays and promotional products that will compliment your trade show or expo marketing. No More Grommets! Maintain a Clean Professional Look. Unique to Giant Printing is the cutting edge Grommet-Free Fabric Backdrop. This revolutionary product attaches to the supplied pipe & drape hardware. And it doesn’t take an army or a college degree to install it. Our 2-Sided Fabric Standee Displays allow you to attract potential customers coming from any direction. 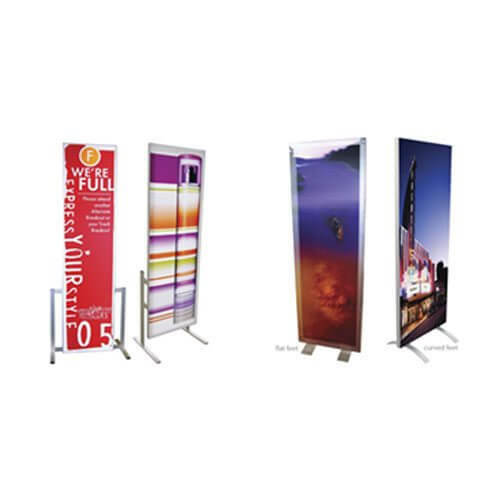 These standee displays pack into a supplied small canvas case for easy transport during travel. Your website and brochure content could be displayed on your standee, which allows you to truly brand yourself beyond a logo. Tested & Approved Fire Retardant Fabric Displays! Our fabric standee graphics are machine-washable and wrinkle resistant. Graphics can be easily replaced after you buy the display. No more wasting time and money storing your shipping crates! You can use your crates as part of your trade show booth to display your products. Why have your wood crates stored away during trade shows when you can make them useful and cover them with case covers to showcase custom information and logo. With Giant Printing, You can now use your wood crates as part of your trade show booth to display your products and advertise your name. 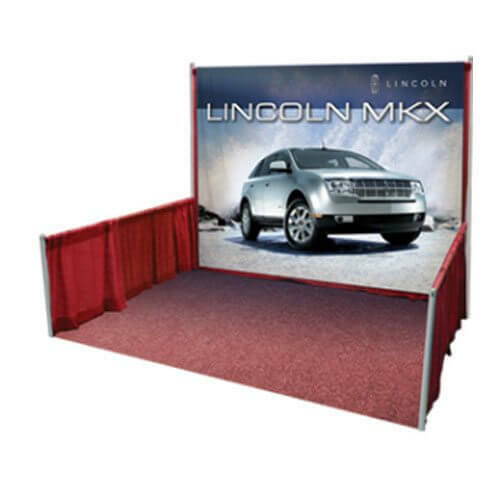 Our Fabric Backdrop Displays set up in minutes and focus on your company’s prospects. Our backdrops are machine washable and wrinkle resistant. You’ll have years of great use. 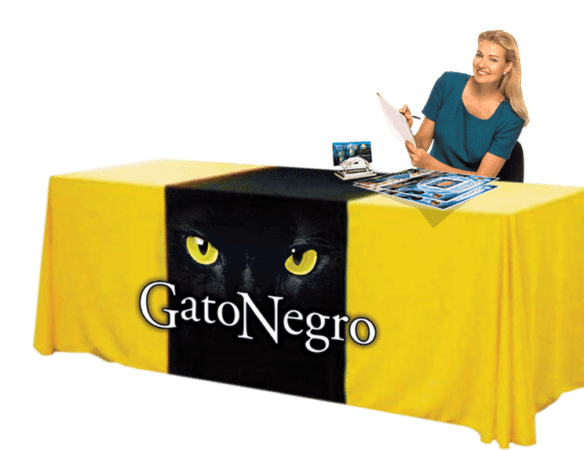 Giant Printing offers customizable trade show and event Display Table Cloths. 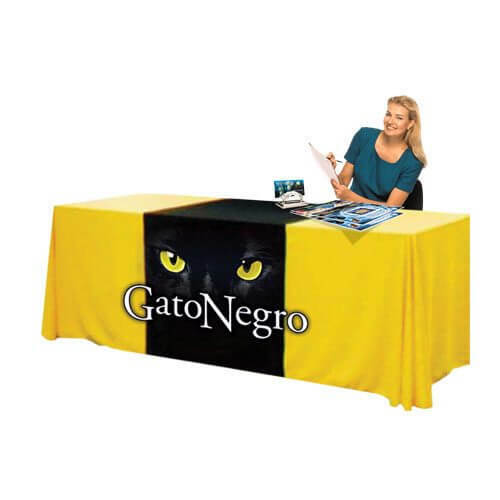 Choose from hundreds of colors or custom design your own Table Cloths with your company’s Pantone colors. Giant Printing’s Podium Banners offer great branding opportunity at meetings, ceremonies and assemblies. Our Podium Banners are a great branding solution for presenting in front of an audience from a lectern or podium, even on a table top. Giant Printing’s Pull-Up Banners are the convenient way to get your message out! 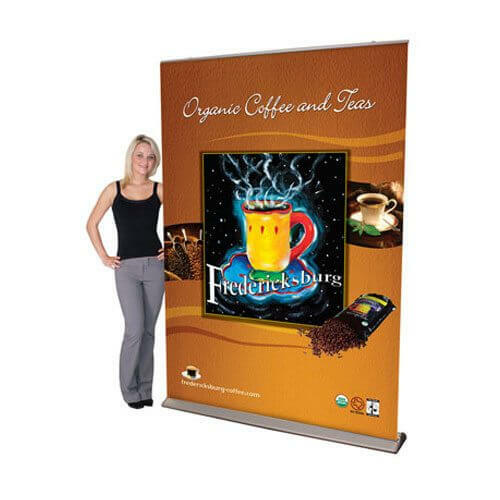 Unlike banners & backdrops, Rollup Banners are free standing & self contained. Our Banners have a sleek, modern design with a huge advertising area! 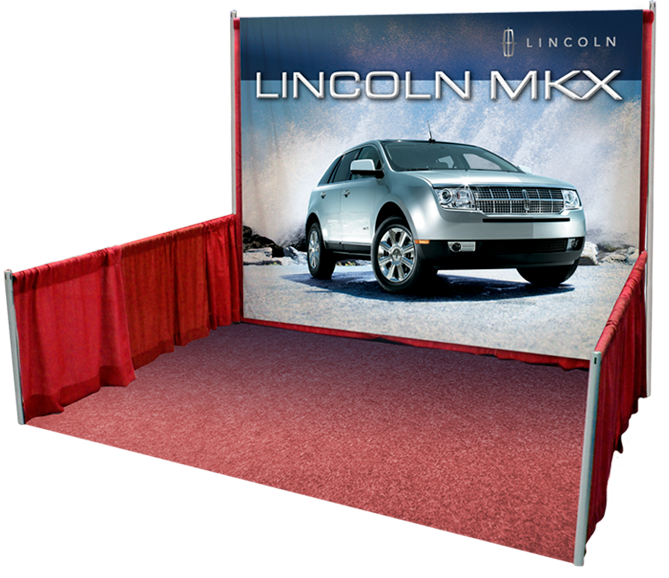 Look your best with Giant Printing’s light weight and portable Pop-Up Trade Show Displays! 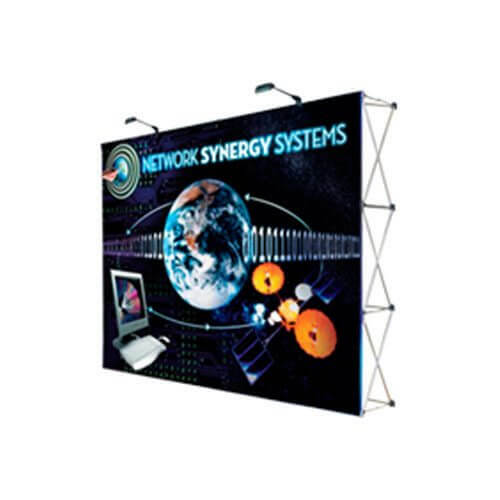 We offer the highest quality, most durable portable displays, designed for impact, quality and ease. An Elegant Alumiframe Fabric Wall Frame Systems can be set up in your home, office, retail or trade shows. 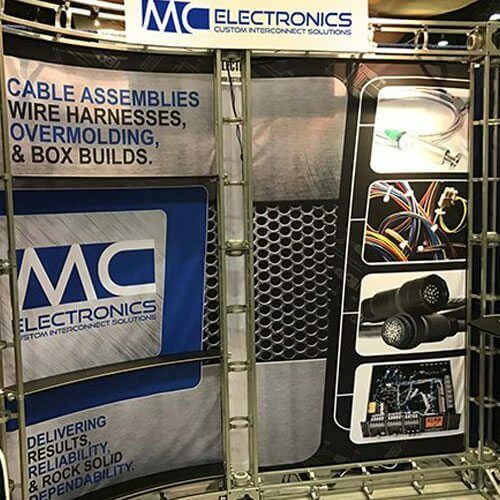 Our portable modular display systems let you raise your brand image while lowering your shipping and installation and dismantling costs. 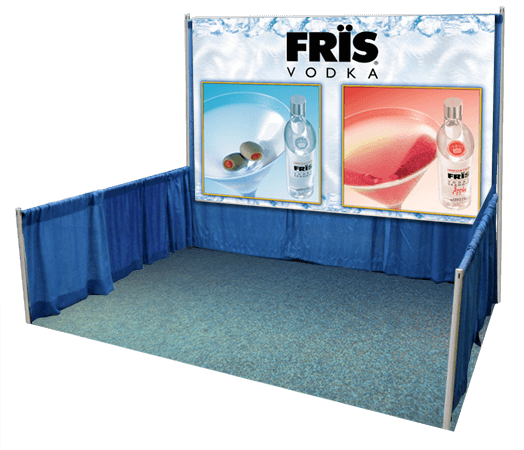 Make your trade show booth a sight to see with a truss display system. There’s unlimited customizable options, assembly is a breeze and they are made out of powder coated stainless steel making them built to last. Giant Printing wants to be your vendor of choice for Trade Show Displays and Promotional Products. 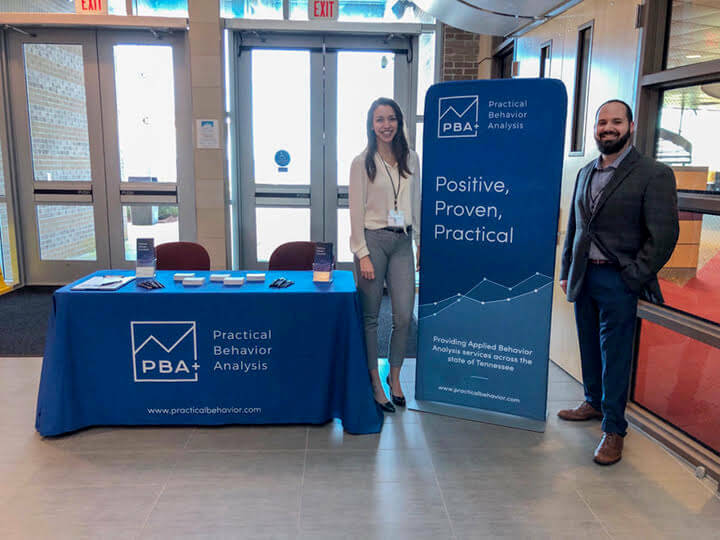 From Logo Table Covers, Giant Fabric Backdrops to an 8’ x 10’ Fabric Pop Up Displays, we provide hi-quality Fabric Backdrops, Banners, Banner Displays, Table Runners and more for trade shows across the country. With an estimated 1.8 million corporate and business meetings, trade shows, and conventions, in the U.S. each year, 205 million people flock to trade shows to learn more about a specific industry and to make purchases. First impressions can make or break a deal. Stop being embarrassed when surrounded by competitors with better Trade Show Displays. 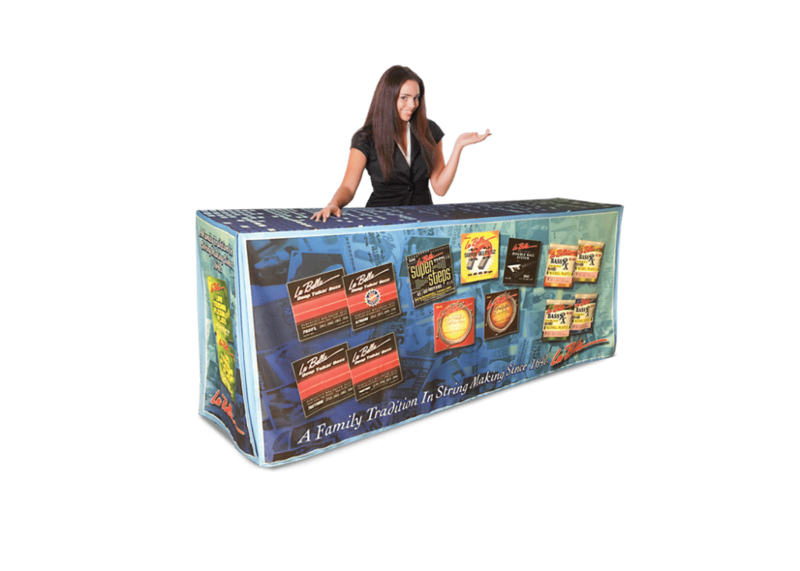 Our Trade Show Graphics can be assembled effortlessly in minutes and are easy to store. 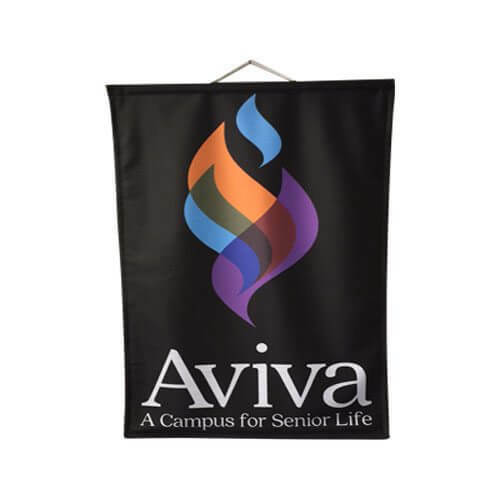 Our full color fabric products and displays are always printed on the highest quality American made fabrics available. We don’t cut corners by using imported fabrics, laminated paper, or toxic PVC vinyl. 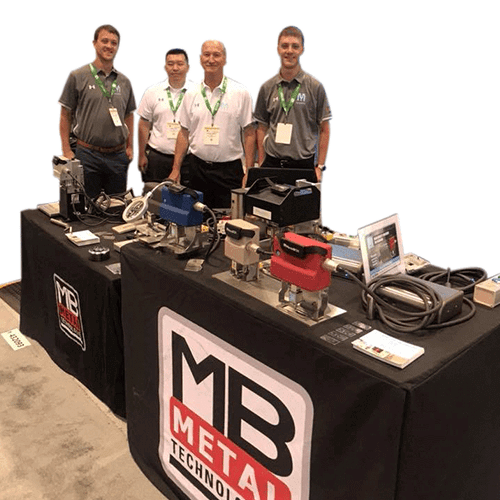 Our Backdrops, Banners and Table Cover products are machine washable, durable enough to withstand years of trade shows, and are non-reflective so you’ll always have the photo-ready display that you need. Competitors’ displays can get lost in shipping, arrive late or broken. You never have to worry about that happening with our products. Our promotional products are compact, lightweight, and portable so you can carry them with you! Get the highest quality Trade Show Graphics at a fraction of our competitors’ prices. With our graphics and displays, you can cut cost without sacrificing quality or brand integrity.